If you mention the word "Tablet" today then most people will immediately think of the Apple iPad or perhaps one of Samsung's many Android tablets. But ten years ago this month, it was Nokia that was pioneering in the early tablet market. Initially announced in May 2005 (but only shipping in November) the Nokia 770 caused quite a stir when it was revealed to the public. 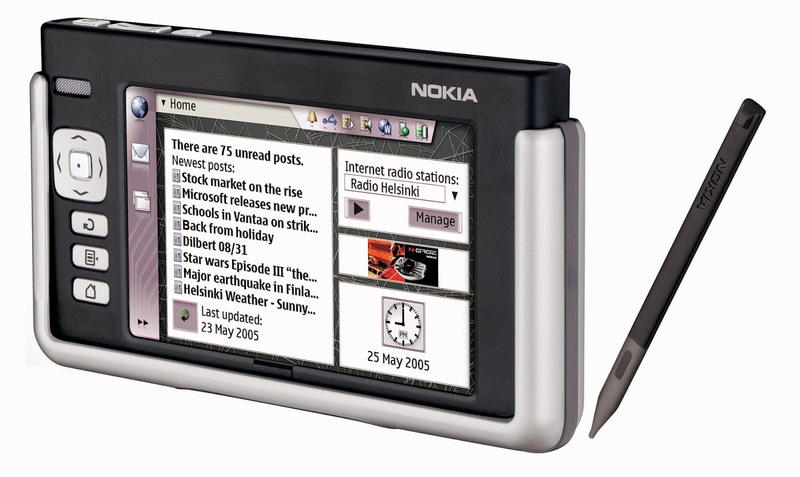 The Nokia 770 broke with tradition in many ways. 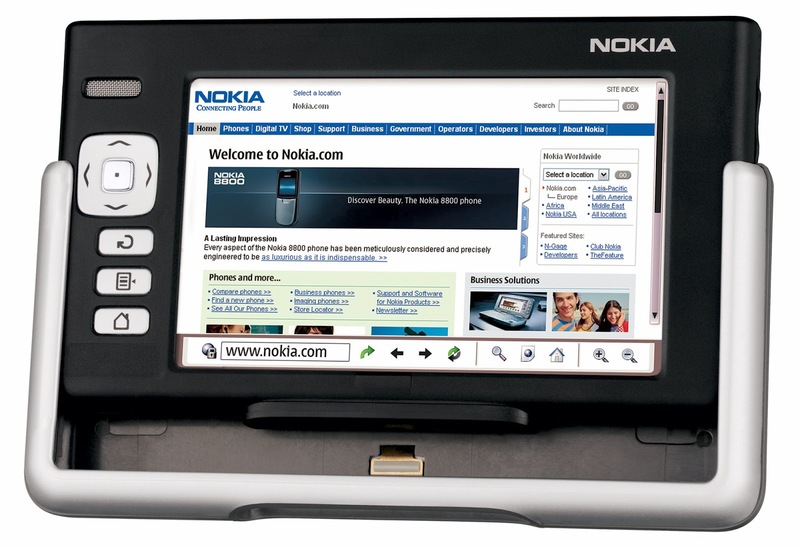 Firstly, at a time that Nokia's smartphones were all running Symbian, the 770 ran a version of Linux called Maemo. The 4.1" 800 x 480 pixel display may seem small by today's standards, but it was much bigger and better than any smartphone on the market. But perhaps the most significant thing was that it wasn't a phone, it couldn't make calls and to access the Internet you either needed to use WiFi or connect to another phone using Bluetooth. Pairing a tablet with a Bluetooth phone was a slightly fiddly arrangement, but the 770 would work with pretty much any Bluetooth device that had a data connection. It also meant that you weren't lumbered with carrying around the tablet when you just wanted to carry a much more compact phone, and because the tablet and phone both had their own batteries then it meant that web surfing wouldn't drain your phone. One striking thing about the Nokia 770 was the physical design, with a very retro-futuristic look, and a brushed metal reversible hard shell. Although the 770 was originally designed to be used with the integrated stylus, a software update made it easier to use with just a finger instead. Maemo was a much more sophisticated operating system than Symbian, and it soon established a dedicated group of developers who starting porting apps from other Linux-based platforms. Out-of-the-box the Nokia 770 had a web browser, RSS reader, email client, some games and PIM functionality, but it wasn't too difficult for someone with a bit of technical knowledge to add more. 2006 saw a major software update which made the 770 a lot nicer to use. Despite all the promise of a little Linux-based computer the hardware platform was very limited with a tiny 64MB of memory and 128MB of onboard flash storage plus an RS-MMC slot. The ARM-based processor was clocked at 252MHz, which wasn't very fast even then. Many of these problems were fixed with the N800 launched in 2007 and a number of other devices following. Ultimately, Nokia could never quite successfully transition these niche devices into success in the smartphone market. The Maemo-based Nokia N900 was the first and last Maemo-based smartphone launched in 2009, and a catastrophic decision to try to merge Maemo with Intel's Moblin OS stalled the development of the product line with disastrous effects. It's an interesting and inexpensive device for collectors, and although they are quite rare they tend to sell for less than €50.. although remember that functionality is strictly limited compared to a tablet of today!